Yard work can be tough, but it especially can be a hassle for individuals with disabilities. That's why the Whole Person brought together groups, churches and businesses Saturday to assist those in need. KANSAS CITY, Mo. 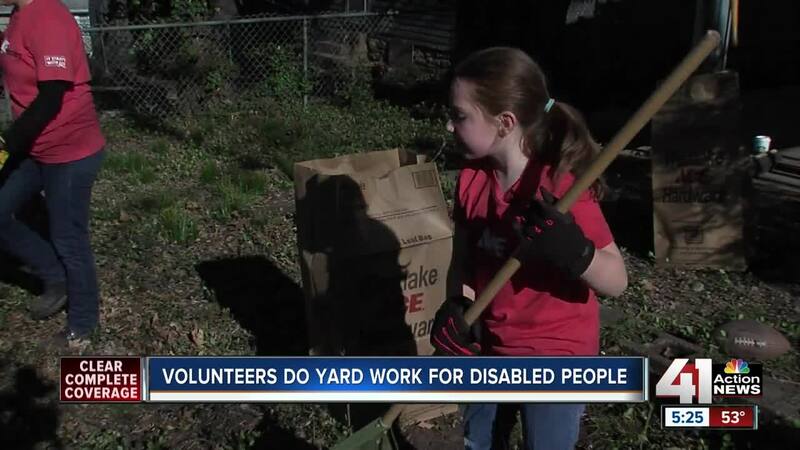 — Yard work can be tough, but it especially can be a hassle for individuals with disabilities. "A lot of people aren't able to get out and can't afford to have their yard work done," Terri Goddard with The Whole Person said. That's why the Whole Person brought together groups, churches and businesses Saturday to assist those in need and give people some peace of mind. "They spend one morning doing yard work for someone who has a disability," Goddard said. The two-day event drew more than 300 volunteers, including McKenzie Dubert, an 8-year-old who spent the morning raking leaves and pulling vines. She believes everyone should make an effort to help their neighbors. "Just do it," Dubert said. "Pretend you are doing your favorite thing in the world, like you are exploring (or) watching TV." She said she is proud she could help someone, even if she doesn't know them. "It feels like I'm making someone proud, like I'm making someone proud of their yard where they live," Dubert said.